STAR athlete Erin Phillips has opted to focus on one code for the rest of her sporting career, officially announcing her retirement from all forms of basketball. Phillips shot to sporting prominence last decade when she became the 21st Australian to be drafted to a WNBA club, before going on to represent the Australian Opals at both the Olympic Games and World Championships. But Phillips, the daughter of former Port Adelaide and Collingwood footballer Greg Phillips, thrived in the inaugural AFLW season in 2017, winning the league's best and fairest award and leading the Adelaide Crows to a premiership thanks to a best-on-ground performance. Phillips in May last year announced her retirement from the WNBA after winning two championships across nine seasons, but left the door ajar to represent the Opals in the future. But the 32-year-old on Tuesday confirmed she'd retired from all forms of basketball to focus on her AFLW commitments. 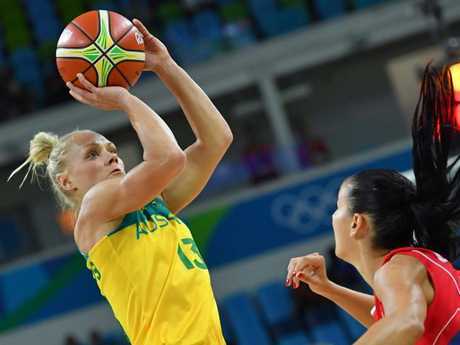 Australian guard Erin Phillip’ last game for the Opals was the quarter-final match between Australia and Serbia at the Rio 2016 Olympic Games. "You know those stories where an athlete announces their retirement and rides off into the sunset, happy and content with how it all finished? This isn't one of them," Phillips wrote for Players Voice. "It's time for me to close the door on my career as a basketball player. 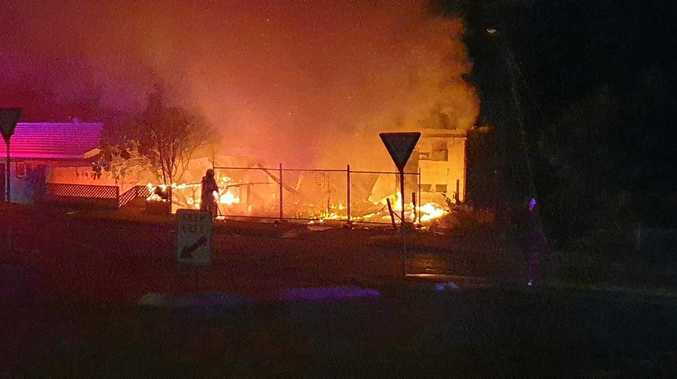 It has been the most incredible journey - but this wasn't the ending I'd hoped for." Phillips' last basketball game for Australia was the quarter-final loss to Serbia at the Rio Olympics, a loss that left her feeling "ashamed, humiliated and even lost". But she revealed the birth of her two children months later, as well as her stunning 2017 AFLW campaign, "saved me in a way". Phillips said she would've loved to have juggled her AFLW commitments with representing the Opals at April's Commonwealth Games, but didn't want to compromised, and miss, Crows training sessions in order to play international basketball again. 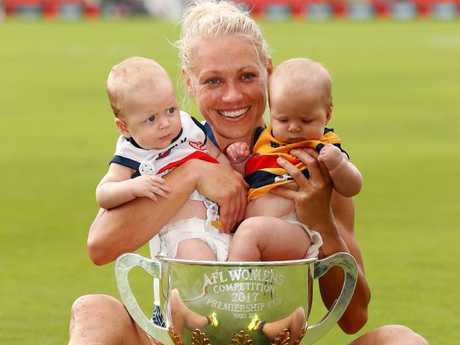 AFLW star Erin Phillips with children Blake and Brooklyn after the 2017 AFLW Grand Final match. And after Opals coach Sandy Brondello recently reiterated to Phillips that she couldn't be considered for selection if she didn't sacrifice her AFLW obligations, the guard's mind was made up. "Going to the Commonwealth Games would have been great. But if I'm honest with myself, it was probably a selfish motivation because I simply wanted to finish on a better note than the Olympics," Phillips wrote. "At the end of this journey, I guess it just wasn't meant to be and sometimes we don't get to decide how to write that final chapter. But I absolutely feel like I've given basketball everything and I know in my heart it's time." Phillips said she would still be involved with basketball and would honour her first full-time coaching role at the Dallas Wings as assistant coach to Fred Williams. Both Williams and Phillips are keen to recruit superstar centre Liz Cambage to the Wings for the upcoming WNBA season after Cambage's dominant 2017/18 WNBL campaign with the Melbourne Boomers.